We gave an introduction to the periodic table of elements by showing the everyday stuff (water, hydrogen peroxide, citric acid, sugar, vinegar, baking soda), and its molecular composition and talked about how the same building blocks (Hydrogen, Carbon, Oxygen, etc.) can make up different substances. We discussed how chlorine by itself is poisonous by in the molecule of salt, combined with sodium, it’s edible for humans. 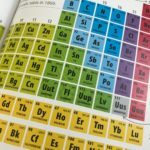 Read: Smithsonian The Elements Book, A Visual Encyclopedia of the Periodic Table. Watch: Science Max on the topic: Chemicals and Atoms. Play: Mix vinegar and baking soda at home. Look up the equation for the chemical reaction. Fun!